"The Nazca Lines /ˈnæzkə/ are a series of ancient geoglyphs located in the Nazca Desert in southern Peru. They were designated as a UNESCO World Heritage Site in 1994. The high, arid plateau stretches more than 80 km (50 mi) between the towns of Nazca and Palpa on the Pampas de Jumana about 400 km south of Lima. 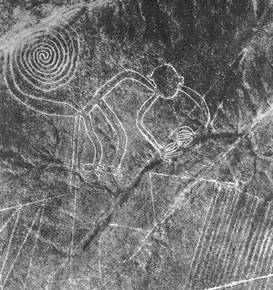 Although some local geoglyphs resemble Paracas motifs, scholars believe the Nazca Lines were created by the Nazca culture between 500 BCE and 500 CE. The hundreds of individual figures range in complexity from simple lines to stylized hummingbirds, spiders, monkeys, fish, sharks, orcas, and lizards. Contrary to the popular belief that the lines and figures can only be seen with the aid of flight, they are visible from atop the surrounding foothills."